LAWN AERATOR SHOE let water, fertilizer and air get down to grass roots, improving the health of your lawn. Simply wear our spikes aerator shoes preassembled and walk around to cover the entire length of your garden. This grass aerator shoes are a one time investment, that's going to help you with several hundred cycles of aeration, and if maintained well even for a lifetime. Our GRASS AERATOR SHOE feature strong metal buckles that won't break. The ergonomic design ensures that the shoes stay firmly on your feet and the sharp nails make it easy to dig the soil for effective aeration. LAWN AERATOR SHOE let water, fertilizer and air get down to grass roots, improving the health of your lawn. Simply wear our spikes aerator shoes preassembled and walk around to cover the entire length of your garden. Even better is wear them while mowing your lawn so that you accomplish two important tasks simultaneously. This grass aerator shoes are a one-time investment, that's going to help you with several hundred cycles of aeration, and even a lifetime if maintained well. Our lawn aerator shoes are made up of a sturdy plastic base which provides a good heel support, 13 heavy duty metal 30 mm spikes on each sandal, and 3 adjustable straps with strong metallic buckles. Our GRASS AERATOR SHOE features strong metal buckles that won't break. 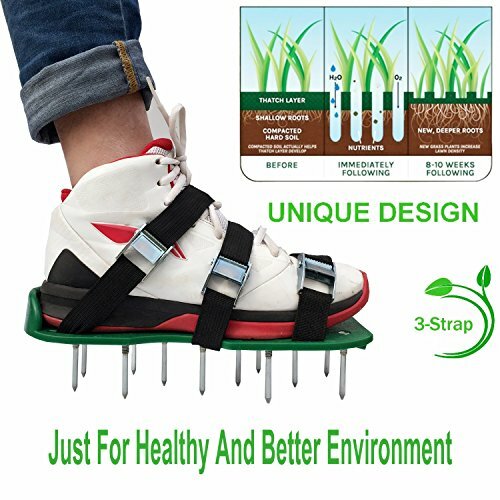 The ergonomic design ensures that the shoes stay firmly on your feet and the sharp nails make it easy to dig the soil for effective aeration. 100% RISK-FREE SATISFACTION GUARANTEE: Aerator shoe not only ensure a healthier and greener lawn, but also come with a 100% risk-free satisfaction guarantee to let you buy with confidence, you will find these lawn aerator shoes sturdy and functionally effective, and you will love yourselves for the decision of buying these when you see your lawn get greener. If you have any questions about this product by NATE, contact us by completing and submitting the form below. If you are looking for a specif part number, please include it with your message.